I have decided to participate in Heather's Top 5 Tuesday post, but with a different topic and that would be cooking! I am going to share my top 5 favorite websites or cooking blogs. Probably my favorite of them all. This woman has great recipes, she photographs every step of the recipe and she has great humor along the way. I have recently found this blog but I love the recipes she has on here and can't wait to try a few. I discovered this blog when she was featured on The Martha Stewart Show for her "cupcake pops". They were a huge hit and she has quickly become popular in the blogging world. I have only seen dessert recipes on this blog but the things she makes are so cute! 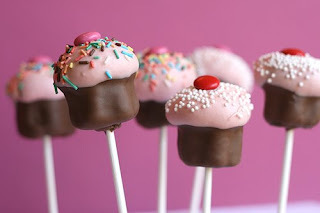 I tried the cupcake pops and failed miserably, so hopefully one day I can re try them. Of course if all else fails, I can always go to The Food Network for great recipes from a hand full of cooks. Paula Deen is my favorite though and I have tried many of her recipes. 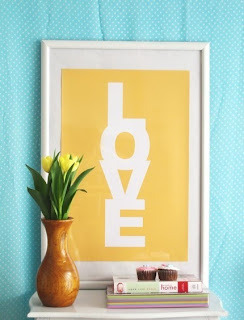 About a year ago, I discovered a site called Etsy through one of my favorite bloggers. It is a place, sort of like Ebay, except it is all handmade things. Anything you can think of, you can find on Etsy. I've always loved handmade things, especially when they are made well and there are many talented people on Etsy. From this Etsy seller. 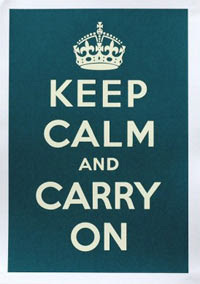 This is a picture that I have seen on many blogs and I just loved it and wanted one for myself. Several bloggers had recommended this Etsy shop so I went straight there and within a few days, I had one of my very own. 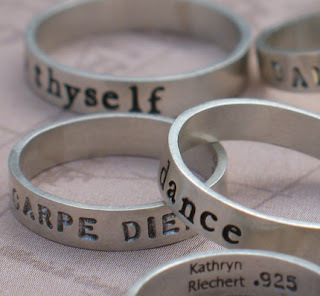 My latest find on Etsy, is the shop of Kathryn Riechert, who makes hand stamped custom jewelry. Shae and I went to the craft store for awhile and then took her to dinner at The Olive Garden. The last time we took her there, she was only a couple weeks old and she slept the whole time. This time, she was wide awake and she loved all the people and the lights and the noise. She was great the whole time and everyone that walked by had to stop and look at her. Cadence at dinner sitting on mommy's lap and looking like a big girl! All snuggly in her jammies. We ended our night by watching the movie "Baby Mama". All I can say is, hilarious! I think I will definitely be buying that one. Nothing too exciting, but just wanted to share a few things I have purchased lately. While on one of my numerous trips to Ben Franklin last week, I saw this paper. I bought every piece they had and I hope they get more in because I will need much more of this for my Christmas cards :) Making Christmas cards has got to be one of my favorite things to do all year. Last year they were quite the production so I need to be more prepared this year. I love magazines, but the problem is they are always sitting in a stack on my desk and then I start to feel crowded. So I picked up this little crate, also at Ben Franklin. It holds them well and is cute too. And last but not least, I love words. I love sayings. I love anything that has words and sayings on them. Becca got me one of these for my birthday that says "Truly great friends are hard to find, difficult to leave and impossible to forget" I have it on my desk at work and I look at it every day :) I see these cute little plaques everywhere and decided to get this one last week. It is something I really believe in and like to remind myself of. 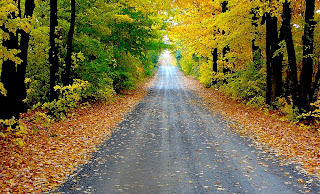 Fall that is, and I welcome it with open arms! On my way to work, I stopped at Starbucks and got my favorite drink, Caramel Apple Cider. If you haven't tried it, you must. "Outings are so much more fun when we can savor them through the children's eyes." Campbell, Cooper and I headed to the Aquarium and Lacey met us there. I took Campbell there a couple years ago, but Cooper has never been and they were both pretty excited. Cooper was pretty funny. He loved looking at the fishes and all he kept saying was, LOOK! LOOK!...BIG! over & over & over. :) It was so cute because he would get so excited. Campbell just looked at everything quietly and stayed right by my side :) They have redone it since we were last there and it is all covered now so we didn't get wet while we were there. The coolest thing to me was watching the kids and the expressions on their faces when they saw things, especially the seals. They were pretty big and dove in and out of the water. We stopped at the gift shop on our way out, and Cooper got a semi truck. It has a tube for the back part of the truck, and you fill it with water and then it has fish and things that float in it. He loves it and wouldn't set it down for anything. I was so excited to go home last night and paint! I had been to Ben Franklin Thursday night and got some things and then I stopped there again last night to get some more things. I bought paper mac he` pumpkins on Thursday, so I went and got Campbell a little one to paint. I also had wooden Halloween face masks to paint, 2 pumpkins and 2 ghosts. My finished pumpkin with candy corn glitter on the top. I thought it turned out pretty well. Campbell, Cooper and I are headed to the Seattle Aquarium and then to Pike's Place Market with Lacey. After that, we are going to the races at Monroe to watch Travis! Definitely a different race day schedule for me as I'm used to be at the track all day, but I'm excited for our fun day in Seattle! In the past week I have not been home before 10 pm one time. That means that I haven't seen Campbell or Cooper in a week, well at least not for any real amount of time. So needless to say, I was happy to be home last night. I stopped by Ben Franklin after work, which I have decided is not a good place for me to go. When I go in there, my mind never stops. I start to think of a million different projects I could do. I had to tell myself, STOP. You have too many projects already :) I couldn't stop myself completely though, and besides getting the things I went in there to get in the first place, I picked up some things to make a Halloween craft. I hope to get to that soon.. When I got home, Campbell was SOO excited to see me :) She followed me right up stairs and stayed there until she had to go home and go to bed. Cooper also joined us and they jumped on the bed for awhile. I got some really cute pics of them and as they were jumping on the bed, we were doing the "two little monkeys" song. It fits them both perfectly, and they are pretty cute little monkeys! Campbell was doing "flips" on the bed and every time she would say "that's totally awesome", of course that line comes straight from Hannah Montana :) Once I finally got them off the bed, Campbell and I colored, Cooper watched a Little People Christmas movie and then Campbell did her water color book. I love spending time with them! Last night we celebrated Shelby's birthday by going to dinner at a little Italian place in Puyallup called Mama Stortini's, a place that I love. They have great food and it's a more intimate setting which is great for dinners with friends. We had a nice time talking with everyone and seeing her friend Sarah's new born baby boy and also her sisters daughter Lily who is almost one. Jeff wrapped her present in Elmo paper since he couldn't find any birthday paper at the house :) He got Shelby a jacket and 2 tickets to the Olympics Gymnast event at the Tacoma Dome next weekend.